This is how we all sound when we have to create a child theme. There is really no rocket science to the process of creating child themes, but as a front-end fanatic, I always look for the best practices. Today when I had to create a child theme, I thought of creating a boilerplate first, by DRY (Don’t Repeat Yourself) philosophy. So, there you go, a WordPress child theme boilerplate was born, and the only parent (me) chose to call it _child. Inside _child’s style.css, there is nothing but a comment for WP to read it as a theme. At line #7 there is a template tag, which you need to replace with the folder’s name of your parent theme. This file is a bit interesting. There’s a function called aa_enqueue_styles() which is responsible for enqueuing two style sheets. Then I enqueued the child theme’s style.css with parent-stylesheet dependency, to ensure that the child theme stylesheet loads after the parent’s one. It lives at GitHub under a tree called GPL license. Start it, fork it. Pull requests are welcomed! P.S. 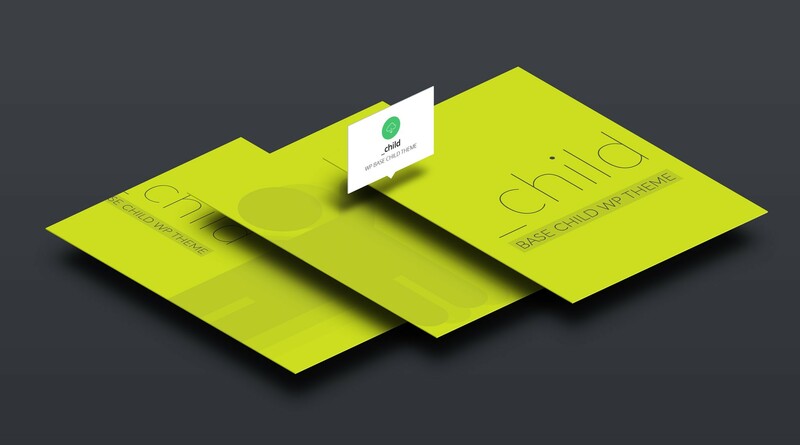 _child is an open-source theme, which means anyone can send pull requests to enhance it and make it better. My friend Matt Cromwell recently contributed to _child in the form of a branch called cleanup, _child in this branch dequeues and deregisters parent theme’s sidebars, widgets, post_types, and scripts (JS & CSS). Thus the name is cleanup. P.P.S. A few beginner developers requested this gif on how to clone the _child boilerplate.